Manufacturing making its way back to U.S.
Reshoring. Near-sourcing. Whatever you want to call it, American products are once again being manufactured in America, industry executives said at a recent Daily Transcript roundtable held in Murrieta. There are many reasons why companies are deciding to move their production facilities back to the United States, but most involve increased control and quality. "In my industry, craftsmanship is everything," said Larry Campbell, director of corporate strategy for Lake Elsinore-based JS Technologies, which makes electric guitars and basses. "Hand craftsmanship is a really big deal; apprenticeship is a big deal. Trying to attract those folks and bring them to that level of quality that our market demands — and that we demand — there was just too big a gap for us [overseas]. Producing the guitars in the United States also gives JS Technologies better control over its supply chain and it helps company officials plan. Kellie Aamodt, regional vice president of sales for United Parcel Service Inc. (NYSE: UPS), said companies are trying to get closer to their customers. For companies serving Americans, that means local manufacturing plants. A local facility allows a company to provide quicker response times, faster delivery and a better customer experience. "We believe in enabling global commerce by optimizing supply chains and helping people in whatever way they see," Aamodt said. "So we absolutely believe in exporting, and certainly there are times when you want to manufacture overseas and be close to your consumers. "We believe in reshoring and near-sourcing because there are times when the quality piece is so critical, and you're not able to get that accomplished [overseas]." Participants agreed that the biggest hurdle facing their industries is the economy — here and around the world. Some of the economic hardship has been caused by political uncertainty. "The average age of our customers is 42 to 55, and if they don’t have a decent job, they won’t be able to afford my product," said Susan Long, president and CEO of San Diego's Diving Unlimited International, a designer and manufacturer of diving equipment, such as drysuits. For UPS, it's all about having efficient airports, highways and other modes of transportation on which their delivery network depends. "We really need to see the investment and make sure we’re putting our money to keep our infrastructure strong," Aamodt said. All local companies have to deal with the high taxes, stringent labor laws and red tape of operating a business in California. It's one of the least business-friendly states in the nation, according to the job placement firm Manpower. "We love California, and our industry loves California, but it’s more difficult to do business here than anywhere," said JS Technologies' Campbell. The guitar industry also is having trouble finding youths interested in playing musical instruments. Campbell said their biggest competitor is video games. "The market is different," from when Campbell was a youngster, he said. "You've got the Internet, cellphones — a bunch of that stuff that’s really fragmenting your market. Finding the next guitar player is tough." Finding qualified employees also can present problems. Daily Transcript Executive Editor George Chamberlin said there are about 6,000 software engineer jobs available in San Diego. "We’re all looking for (a strong work ethic)," said Patrick Billman, vice president of Cryoquip Inc., which manufactures cryogenic and gas processing equipment in Murrieta. "In the technical area, we’ve been most successful working on internships with the colleges. We find it very successful working with young kids when they're in school. They build that team relationship with you." 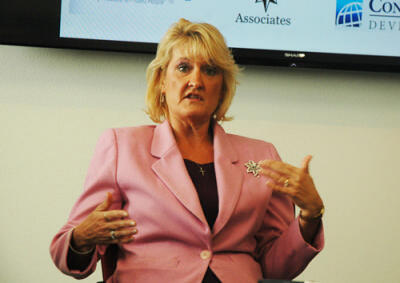 Attracting and retaining employees can be as simple as maintaining a comfortable work environment, panelists said. "The best way you find people is by being a totally awesome employer," said Long of Diving Unlimited International. "And having a place where people want to work, and a product that they want to represent. Give them decent working conditions. "And you have to relate to your people. You walk around and you talk to people. You have to be a place that people want to work." When JS Technologies moved into its new facility, the company created a friendly workspace with ergonomic desks, LED lighting and soda and coffee machines. The company also continues to hold events such as chili cook-offs for the staff. "We try to create this great environment, but the No. 1 thing we do because of our industry is we look for players," Campbell said. "You need to be a musician, preferably a guitar player. "We really want people from the industry, in the industry, because we have our own language, and you can’t fake that." UPS likes to make sure it retains its best employees so the company can promote from within. "We try to have a very positive climate because we want those people to grow within UPS, and that’s the real backbone of our company," Aamodt said. "We really believe that it's your manager that makes a big difference, so we drive it at a local level."